Also known as Moses; according to Josephus, his true name was Osarsiph. Mosheh is well known as the Hebrew Lawgiver and founder of the Abrahamic Religion of Judaism, serving the early Israelites as Prophet, Priest and King. 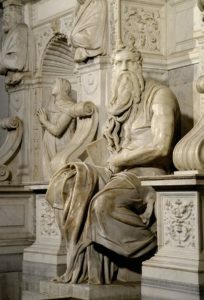 Like Jesus, Moses was probably, in actuality, a syncretistic figure. Crowley considered him to be a Magus of A:. A:., whose Word was IHVH, which expresses the structure of the Universe. Traditional representations of Mosheh, including the famous statue of Michelangelo, often portray him with horns. See Chapter 73 of Liber Aleph and Chapter 7 of The Book of Lies. The story of Mosheh is set forth in The Bible, which is included in Section 2 of the A:. A:. reading list. According to the Hebrew legend, Mosheh was born during the Captivity of the Israelites in Egypt, at a time when the Egyptian Pharaoh had ordered the infanticide of all male Hebrew children. To protect him, his mother hid him in an ark of bulrushes, sealed with pitch, and set it at the edge of the Nile. It was discovered by Pharaoh's daughter, who returned the child to his mother to be nursed. Later, the mother brought the child to Pharaoh's daughter, who named him Moses (meaning “saved from the water”), and he grew up at Pharaoh's court. One day, he killed an Egyptian overseer whom he saw beating one of his Hebrew brothers, and he was forced to flee into the land of Midian. He stayed for a while with Jethro, priest of Midian, married his daughter Zipporah, and fathered a son, Gershom. While tending Jethro's flock on Mount Horeb, or Sinai, he encountered a strange vision, a bush which burned without being consumed. The burning bush spoke to him, and identified itself as Elohim, the God of his people, and also as IHVH, a Name unknown to the fathers of Mosheh. IHVH charged Mosheh with the task of liberating the Hebrews from Egypt, and conferred miraculous powers upon him, such as the ability to change his rod into a serpent and back again. Mosheh returned to Egypt to petition Pharaoh to release the Hebrews, but Pharaoh resisted. Pharaoh's intransigence caused IHVH to bring down seven plagues upon Egypt, but Pharaoh stubbornly refused to liberate his Hebrew slaves. Finally, Mosheh rallied the Hebrews for an escape attempt. Using the magical powers bestowed upon him by IHVH, he parted the waters of the Red Sea for their flight, and closing them up again upon the pursuing Egyptian army. Mosheh provided the Hebrews with miraculous food and drink in the desert: manna from heaven for food; and water which gushed from the rock of Horeb when he struck it with his rod. He also provided them with The Sacred Law: he revisited the mountain and the burning bush, and returned with the ten commandments. Mosheh may be identified to some extent both with Zarathustra in Persia and Minos in Crete. Both, like Mosheh, are said to have ascended mountains and there to have received the Law from God.